What is WiFi Monitoring and How Can it Help My Network? The practice of WiFi monitoring has gained importance as more and more individuals and businesses implement wireless communication networks for their computers and mobile devices. A WiFi network offers enhanced convenience and flexibility that cannot be matched by a traditional wired network environment. These characteristics have led to the incredible growth in the adoption of wireless networks as the first choice for gaining connectivity in your home or office. We are going to investigate some issues that WiFi networks introduce that affect the performance and security of your network communications. Then we will look at how WiFi monitoring can help alleviate or minimize those problems. We will also show you some WiFi monitoring software for your Mac that will help you maintain a secure network and improve its performance. WiFi networks pose some problems that are not present in a wired network. These issues can lead to degraded network performance as well as to an increased risk of unauthorized access or security breaches. We are not concerned with public WiFi in this discussion, and you should always exercise caution and employ a VPN when using a public WiFi connection. Here are some of the performance issues that you may encounter with a home or office WiFi network. Slow or no Internet access in some locations that should have connectivity. The location of your router may be the cause of this problem. Slow performance throughout the network. This may be related to unauthorized users on your network. It can also be caused by overuse of WiFi channels leading to network bottlenecks. The existence of intermittent connection failures. Rogue access points — Unauthorized entry into your WiFi network can be accomplished by individuals located outside your building who are accessing your wireless signal through rogue access points. Data Interception — Data transmitted wirelessly is more prone to being intercepted by unscrupulous entities than data traveling over a wired network. Unencrypted sensitive data can be compromised leading to financial or personal repercussions. Hacker attacks — Hackers can go after your wireless network in a number of ways including man in the middle attacks, denial of service attacks, and endpoint attacks. WiFi monitoring is accomplished through the use of various software tools that can help address the problems that you may run into with your wireless network. Through the use of a WiFi monitor, you can improve the performance of your network so its users can enjoy a better network experience. A WiFi monitor app can assist in properly locating your wireless router to cut down on slow performance and eliminate dead spots in your home or office. A wireless monitor can also be employed to enhance your network’s security by alerting you to the presence of intruders on your network. It can also be used to identify the location of possible rogue access points and help you tune the signal’s strength to keep it contained and less available to unauthorized users. Who Should Be Concerned With WiFi Monitoring? Network administrators — Monitoring the network is one of the major responsibilities of corporate network administrators. They may use professional-grade hardware components or software tools to accomplish this goal. Small business owners — In many cases, a small business owner who implements a WiFi network for their employees or customers will be responsible for maintaining the network. Monitoring tools are essential to ensuring that the network is safe and performing optimally. Anyone with a home WiFi installation — Keeping the data that is resident on your home computers and devices warrants monitoring your WiFi to ensure that it is only being used by the members of the household. 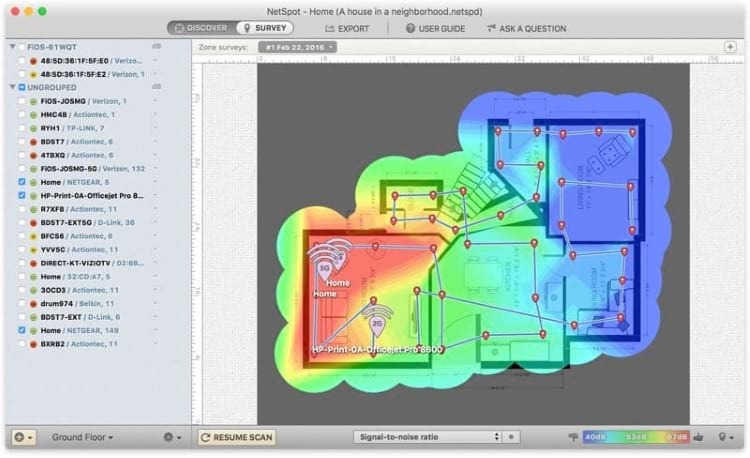 A WiFi monitor can be instrumental in helping you locate your router so everyone can connect from anywhere in the home. What WiFi Data Can Be Monitored on a Mac? Through the use of various WiFi monitoring tools available for the macOS, you can use your Mac to monitor many aspects of your wireless network. In order to monitor all characteristics of your network, a combination of different WiFi monitoring software applications are required. Let’s take a look at some of the WiFi monitoring apps that you can run on your Mac and what they can do to help you maintain your wireless network. This WiFi monitoring and surveying tool is available in free and paid versions that afford varying levels of functionality to the user. It can be used to address many issues that may arise with the planning, deployment, and management of your WiFi network. Netspot is an excellent tool for conducting site surveys that will enable you to position your network components optimally. It can be instrumental in indicating the type of equipment you need and where to locate it in your facility. Look into performance issues by monitoring channel and bandwidth usage. Security is enhanced with the application’s ability to locate unauthorized access points and verify the security settings of any wireless network. This feature-rich app is a must for serious network monitoring. 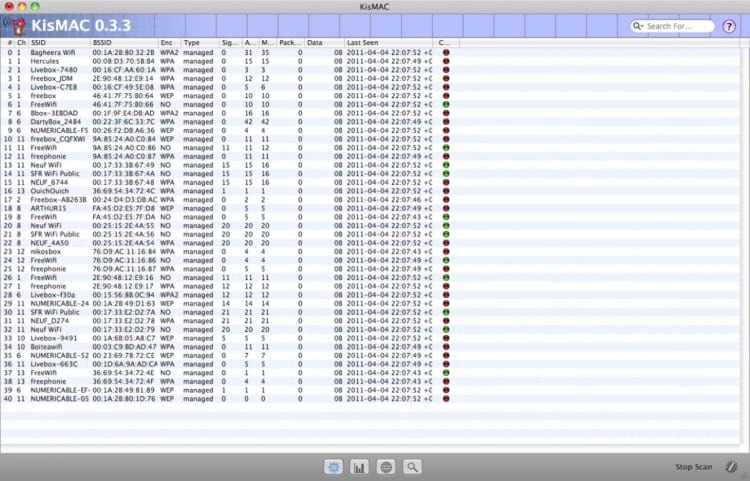 KisMac2 is an open-source, freeware application that runs on the macOS. Its main function is as a WiFi sniffer, and it can be used to locate all of the wireless networks in range of the machine that is running the tool. Installing the software on a laptop allows you to monitor your network to ascertain the signal strength and the ability to connect a device from various locations in your projected coverage area. It is designed to be used by individuals who have some experience with network monitoring. Using the tool can help you locate potential leaks in your WiFi network that will enable unauthorized access from outside your building. You can monitor data packets to see what is going on in your network. It can also be used to conduct penetration testing by using its wireless injection and cracking features. If you can crack your network, rest assured others with bad intentions can also gain entry. 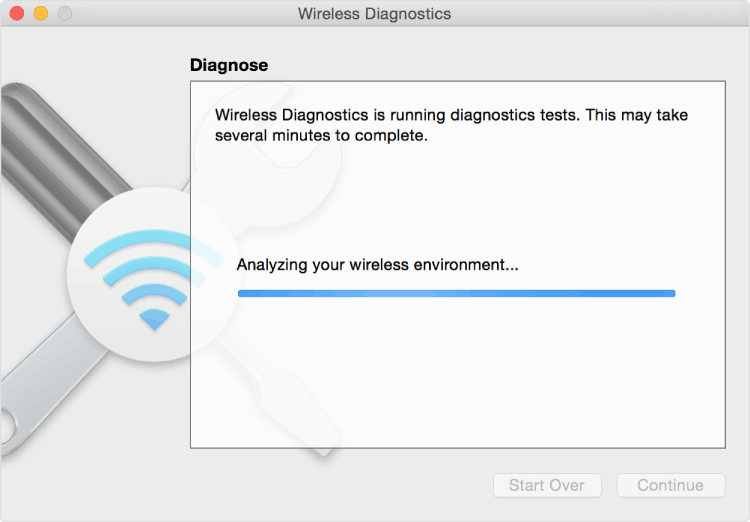 You can perform quite a bit of WiFi monitoring using the macOS Wireless Diagnostic Tool which is incorporated into the operating system. It can be very useful for diagnosing connectivity problems that you are experiencing with your machine and your WiFi network. With a few clicks, you can monitor your wireless network and create a diagnostic report that can indicate the source of problems. The report provides information on many aspects of your WiFi network including dropped connections, potential leaky access points, and whether your network is properly named. This is an often over-looked tool for diagnosing WiFi issues on a Mac. Open it up by accessing your WiFi status menu with the option key depressed and choosing Open Wireless Diagnostics. If you are at all concerned with the performance or security of your WiFi network you should embark on a program of periodically performing comprehensive monitoring. It will keep your data safe and enable all connected users to enjoy the convenience of optimized wireless connectivity. Next PostWhat is a Network Sniffer and What is the Best Way to Use One?